Last week was an interesting turning point in my life and where I want to take this blog. After a lot of soul searching, motivational TED talks, research and wistfully staring into cups of matcha, I decided I needed to make some changes or it would be another year, another stress-induced breakdown, and another “dream” that didn’t come true. One of the things that came out of that period of intense self-reflection is creating a vision board. The concept isn’t new, but it’s importance in helping me stay accountable has never been more relevant. I’m not the most artistic person in the world (actually, I’m quite terrible), but something about sitting at a table for a few hours, cutting up some paper and creating a vision board that is unique and has meaning was so therapeutic. I’ve been incredibly stressed out over the past few months, but after a certain point, I didn’t even realize it. Talk about a recipe for disaster. I knew that something needed to change, but I was struggling with how to translate a vague pipedream into something that was tangible. I needed to change but wasn’t sure how. Setting goals isn’t actually that hard. In fact, earlier this year, I had a whole post about the SMART method and setting realistic goals. However, I think there’s something different about sitting down with a nice, brand new bullet journal at the start of the year, creating well-meaning goals that pass the rigors of the SMART criteria, and then ultimately losing steam a few weeks, or even months, after you’ve started. You can do everything right and still fail. I used to think that was a bad thing. The idea of failing, and failing in such a public, spectacular way was absolutely terrifying. Social media, especially if you run a blog or create anything that’s incredibly personal, can leave you vulnerable. You’re literally inviting people into your life. What will people think? How will they think I look? Will people judge me differently? In getting so caught up with how others would view my perceived failures, I ultimately lost sight of my vision and goals: sharing my own personal stories and research about this little thing called “adulthood.” Even with the best intentions, sometimes it helps to get a little motivation. It was nice to go home, but besides moving back to Dallas (which I’m not doing anytime soon), I needed to create other ways for a little pep talk. I needed to create a vision board. If you’re not familiar with a vision board, the idea is pretty simple. You take a stack of those old New Yorkers piling up form that subscription sale you impulsively bought two years ago, get a big ol’ poster board and some glue. You tear, snip, and paste your heart away. You hang it up. You become a certified professional organizer. Your life is fixed. In theory, yes, that’s all there is to it. However, if you want to fully commit (and don’t have three hours to exclusively read just about vision boards, aka my idea of a fun evening) here’s a slightly more detailed step-by-step process. 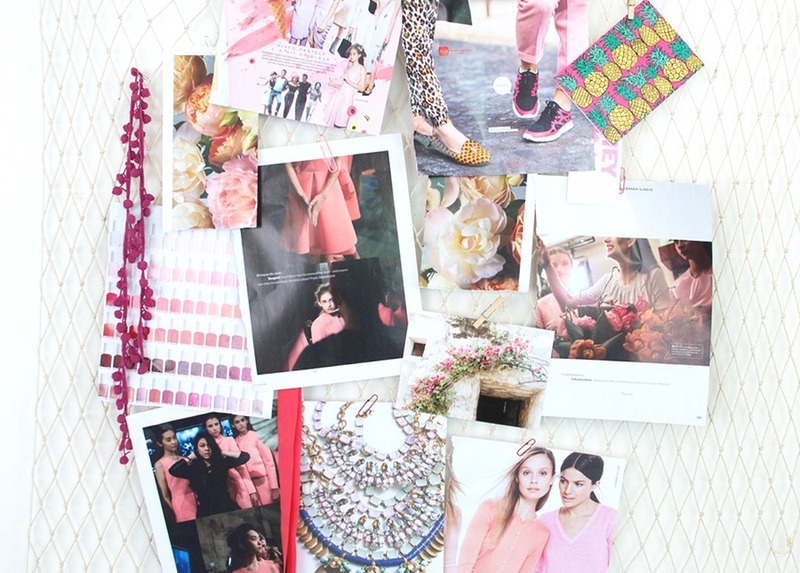 What the heck is a vision board? Vision boards are based on the idea of visualization, which is basically just really specific daydreaming. Imagine what you’re trying to accomplish, whether it’s traveling more, completing a specific fitness goal, or learning a new skill, and really try to picture yourself completing the action. Think about how you feel, the actions or sensations in the moment, and any other specifics. Feels pretty great, huh? The idea of a vision board is to take all of those warm, empowered feelings surrounding an idea or action, and sticking them in a place where you’re constantly reminded about that feeling. It’s basically like putting a concerned, supportive parent or friend on your wall who is constantly cheering you on and giving you a friendly little push that you told yourself you’re going to do something, so gosh darn, you better do it. I started my vision board by asking myself just one specific question: What do I want my life to look life in 2023? Picture in your mind your best self, whatever that looks like for you. How do you feel? Where are you living? Are there certain things in this image of your best self that you’re not doing currently? When I picture my best self, I envision someone who doesn’t report to anyone professionally, is a seasoned traveler, has meaningful relationships, and is a smart, capable adult who is able to handle any financial or emotional baggage without completely falling apart. Okay, great, so how do I actually make one, Kayla? After I pictured how I felt and what I wanted my life to look like, I then needed to break down that feeling into images and words. I had a handy stack of half a year of New Yorkers lying around, but any form of print media is fine. Some people suggest Pinterest boards as another option, but here’s the thing: you don’t look at Pinterest 24/7. If you do, we probably have some larger problems on our hands. Even if you have to print some images out, or do a very minimalistic vision board, it’s a lot easier to remember something if you’re faced with looking at it all the time. It’s literally the power of subliminal messaging. I found images for my vision board through a few places in the New Yorker and Bon Appetit. Advertisements are one of the best way to find content. Yeah, they’re trying to take your money, but I bet you’ll find a few action words that are also relevant to whatever you’re trying to accomplish Looking through content actually produced by the magazine is also a good option, especially if it’s a niche topic related to what you want to visualize. Bon Appetit was a natural choice to combine my love of exploring and great food. Find your whatever your version is. One of the other great things about creating a physical vision board is that you get to play around with what you want it to look like. It was so much fun to organize and move around something tangible. Creating a vision board is basically like adult craft time. Great, I’ve done it. Now what? First, pat yourself on the back. You’re already one step closer to realizing at least one thing — and if you’re feeling depressed or anxious, that’s already a huge step! Now hang up your vision board somewhere you pass by a few times each day. Make sure it’s somewhere visible so that it’s hard to miss. Recognize that realizing whatever you’ve symbolized on the vision board doesn’t mean it’s going to automatically happen. The board is there as a reminder and motivation, not the final step. Find a human vision board! If you’re comfortable with sharing your goals with friends, it’s helpful to have a few accountability partners who can help pull you back up if, or when, you start to get discouraged. Be patient and kind to yourself. Things like forming new habits, or creating real change, takes, on average, around 2 months. Are you sprinting out the door now on your way to grab some glue and a poster board to make your own vision board? Let me know below! When she’s not searching for the best matcha lattes in Brooklyn, Kayla helps other young millennials live more intentionally, travel, and enjoy tasty food — all while living on a budget! Read her blog here.